After leaving the label, Rakim began recording new songs for the album and Dr. Dre allowed him to keep the songs that he originally produced. Then in 2007, Rakim decided to record completely new songs for the album. In an interview with Billboard on July 13, 2009, when asked about if this album contains any material from the unreleased album he did with Dr. Dre, he stated "No, that's locked down in the lab for now. This is me live from New York City, everything brand new." "The majority of this album has that melodic New York sound- I just tried to make it a good, all-around New York album," he says. "That's why I did songs like 'Euphoria,' with [New York rappers] Jadakiss, Busta Rhymes and Styles P-wanted to make sure our presence was felt." Rakim confirmed that The Seventh Seal would have 14 tracks, with the main guests being Maino, I.Q., and his own daughter Destiny Griffin. Several songs on the album were produced by longtime Rakim collaborator Nick Wiz and featured beats from Nottz, Needlz, SR. Shakur Jake One, and from Italian rapper/producer Bassi Maestro. Song samples The Electric Prunes "Holy Are you"
^ Adaso, Henry. Review: The Seventh Seal. About.com. Retrieved on 2009-11-21. ^ Jeffries, David. "Review: The Seventh Seal". Allmusic. Retrieved 22 November 2009. ^ Martins, Chris. Review: The Seventh Seal. The A.V. Club. Retrieved on 2009-11-24. ^ Weiss, Jeff. Review: The Seventh Seal. Los Angeles Times. Retrieved on 2009-11-17. ^ Breihan, Tom. Review: The Seventh Seal. Pitchfork Media. Retrieved on 2009-12-02. ^ Martin, Andrew. Review: The Seventh Seal. PopMatters. Retrieved on 2009-11-20. ^ Cataldo, Jesse. Review: The Seventh Seal. Slant Magazine. Retrieved on 2009-11-17. ^ Reeves, Mosi. Review: The Seventh Seal. Spin. Retrieved on 2009-11-15. ^ Serwer, Jesse. Review: The Seventh Seal. Time Out. Retrieved on 2009-11-17. ^ Mlynar, Phillip. Review: The Seventh Seal. The Village Voice. Retrieved on 2009-11-18. ^ "Hip-Hop Legend RAKIM Drops "Holy Are You" On July 28, 2009. Lead Single From Long Awaited Album THE SEVENTH SEAL". 2003-07-18. Archived from the original on January 25, 2013. Retrieved 2003-08-23. ^ a b c Paine, Jake (2003-09-24). "Details Emerge On Rakim's Seventh Seal". HipHopDX. Retrieved 2009-09-25. ^ Hip Hop Album Sales the Week Ending 11/22/2009. HipHopDX. Retrieved on 2009-11-25. ^ The Seventh Seal (2009): Reviews. Metacritic. Retrieved on 2009-11-25. ^ Carpenter, Troy (2003-07-17). "Rakim Parts Ways With Dre's Label". Billboard. Nielsen Business Media. Retrieved 2009-07-13. ^ "Rakim 'The Seventh Seal' Album Details". HHC Digital. 2003-08-13. Retrieved 2009-08-13. 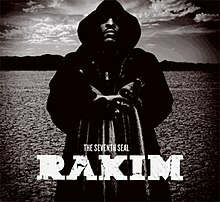 ^ "Rakim The Seventh Seal Review". 2003-09-15. Retrieved 2003-09-15. ^ a b Mitchell, Gail (2009-07-13). "Rakim Ready To Release 'The Seventh Seal'". Billboard. Nielsen Business Media. Retrieved 2009-07-13. ^ "Rakim Wrapping New CD, Touring With Ghostface". About.com. Henry Adaso. 2007-10-11. Retrieved 2009-07-13. ^ "Rakim Wrapping New CD, Touring With Ghostface". About.com. Nielsen Business Media. July 14, 2009. Retrieved 2009-07-13. ^ Concepcion, Mariel (November 21, 2009). "6 Questions with Rakim". International Index to Music. Billboard. Retrieved October 5, 2015. ^ "Rakim 'The Seventh Seal' Album Snippets & Tracklist". 2009-10-19. Retrieved 2009-10-19. ^ "Rakim 'The Seventh Seal' album stream". 2009-11-10. Retrieved 2009-11-10. This page was last edited on 2 March 2019, at 12:50 (UTC).